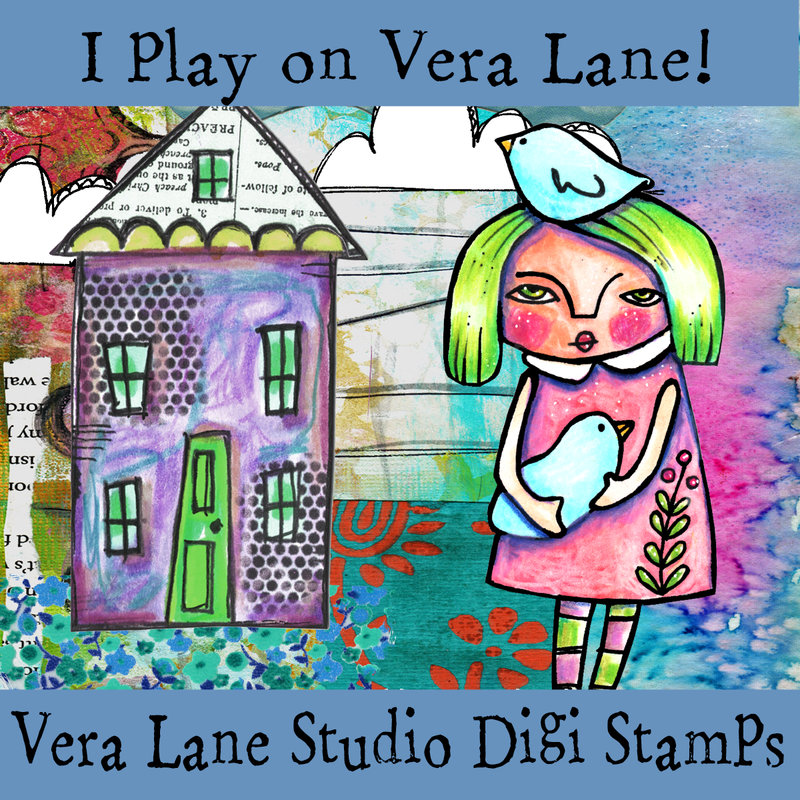 I hope you 'FLIP' over this darling little mini album! This is so unexpected and FUN ... 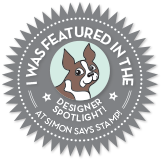 I just LOVE it! 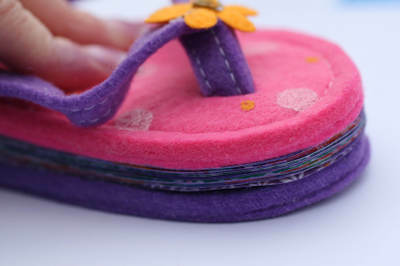 I hadn't planned on designing a FLIP FLOP Mini Album until I spotted these felt FLIP FLOPS in our local craft store. I was walking down the isle admiring all of the home decor that matched our Tutti Frutti Collection and then I saw these! They were so cute and for $2.67 a pair ... SOLD! I had to get me some! 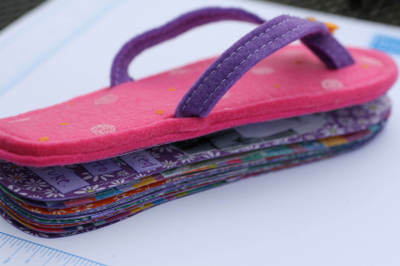 You will see here that I have actually combined two pair of FLIP FLOPS to make my mini album ... but we'll talk more about that later. 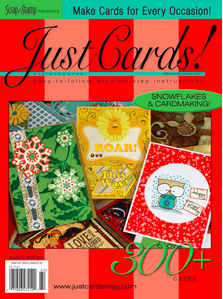 This project really is FUN but do plan on more than an hour to complete your own mini album. This one took me about 2 - 2 1/2 hours from start to finish. (Including time to round up photos and think of things to say). This is so EASY to do ... let's get started! 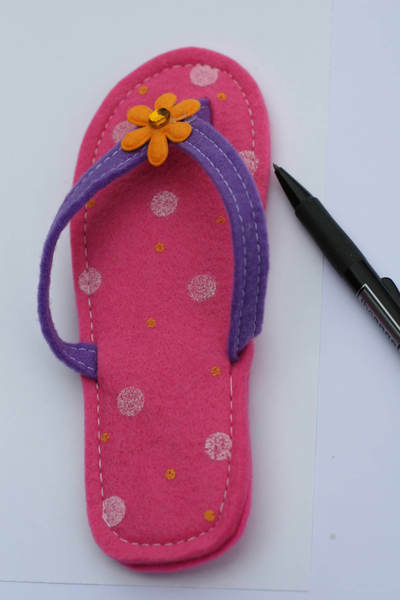 First, I needed to make a pattern so I traced around the FLIP FLOP. I did this on a scrap piece of cardstock and then cut it out. Then I marked on my pattern where I was going to leave the 'scored and folded' edge. 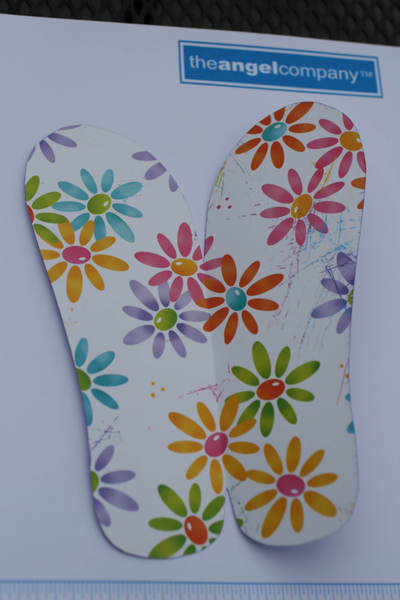 Next, with my Scor-Pal I scored my patterned paper in half and then traced on my FLIP FLOP pattern with a pencil. NOTE where the 'scored and folded' edge is on the paper. 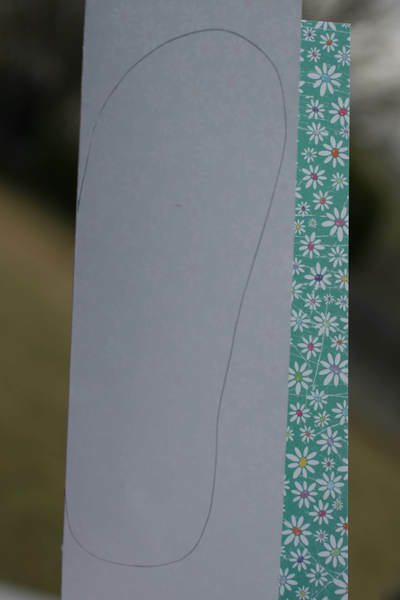 Trace your pattern onto your paper and then cut out. This is what your paper will look like when you open it. Ok. So it's not that big of a deal to the outcome of this project, but, isn't that interesting! This die-hard sponge girl is buying more stipple brushes! After I traced and cut out all of my pieces I put them into the order I wanted. As shown below ... I always matched up the RIGHT side of one pattern to the LEFT side of the next. 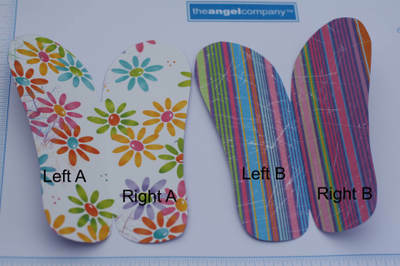 The LEFT side of Pattern A will be attached directly to my FLIP FLOP and not another sheet of paper. 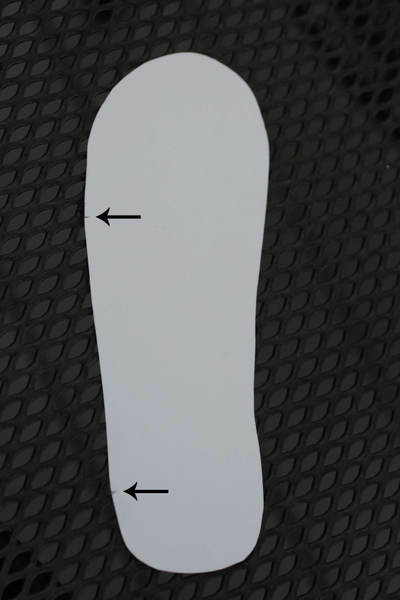 Eventually, the RIGHT side of a pattern will be attached directly to the bottom of my FLIP FLOP and not attached to another sheet of paper. Next, I needed to connect each piece. 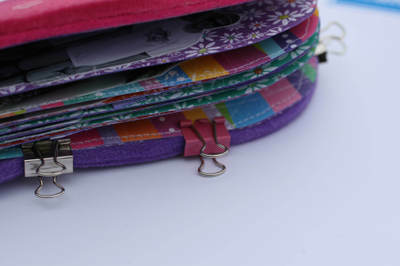 I used a sewing machine for this step, however, you can easily attach your pieces with adhesive. After I attached my pieces together I embellished them with photos and journaling. 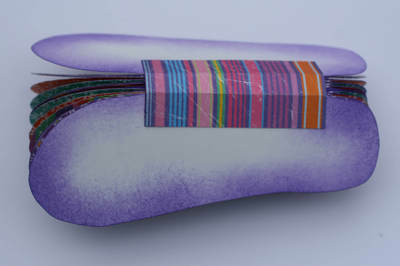 Then I took a scrap piece of Tutti Frutti and constructed a spine to POLISH the binding of my album. I folded a piece of Tutti Frutti in half giving me extra strength to support my book. I attached this to the outside flaps of my album with adhesive. Next I attached the top of the FLIP FLOP to my album using adhesive. 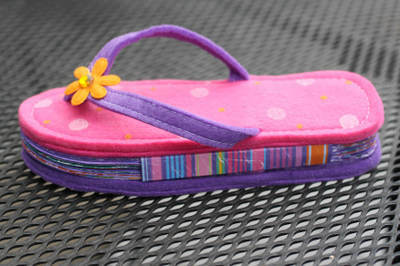 Before I attached the bottom FLIP FLOP I had to do a little modifying. You see ... I actually used 2 pair of FLIP FLOPS to make this album. For this album I used the 2 LEFT feet. (Now I can make another album using the 2 RIGHT feet). And attached the bottom of my album. I used clips to hold things securely in place while it dried. And after everything dried ... I had a DARLING little mini album! 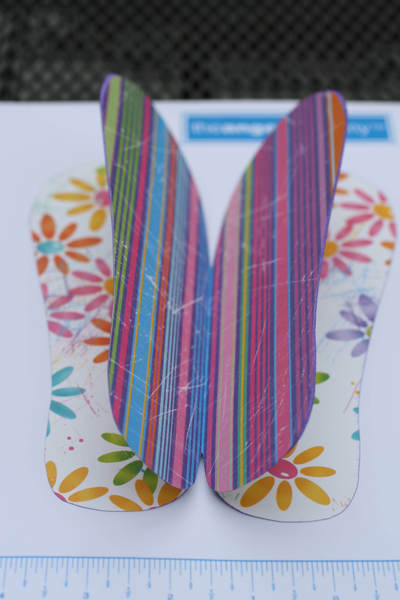 You can check out the inside of my Tutti Frutti FLIP FLOP Mini Album located in my Photo Album. This VERY unexpected little album really took me outside my box! I haven't 'cut out' photos like I did since probably college. I've never journaled like this before ... the words themselves and the cutting the words out like I did ... it was TOTALLY FUN! I WILL do it again! Of course, I sanded the edges of my photos! (I just can't help myself). Sophie saw the FLIP FLOP album tonight and gave me ONE thumb up. I would have gotten TWO, however, she didn't like one of the photos I used of her. I CAN live with that! 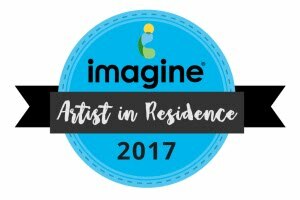 I hope you are inspired to try a project like this. 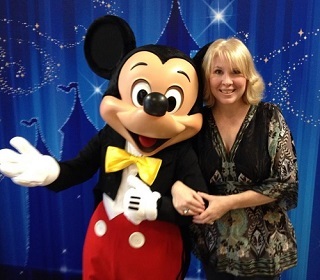 I encourage you to think outside your box and do something you normally wouldn't. It's SIMPLY FUN! 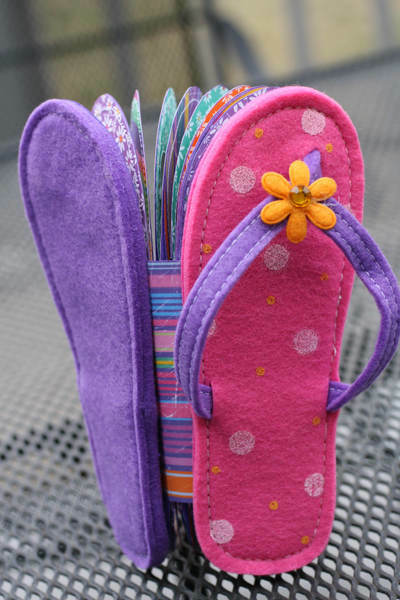 Our Tutti Frutti Collection SCREAMS happiness and it is a perfect match to all of the great summer gadgets (like these FLIP FLOPS) in the craft stores this year. 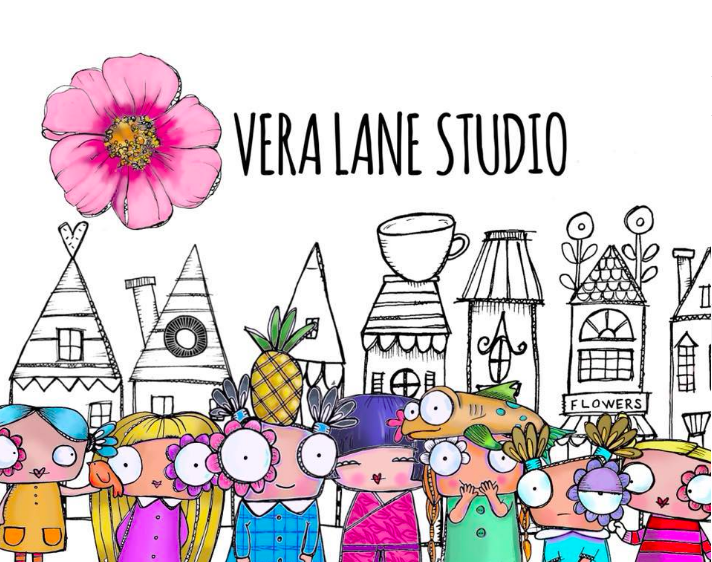 This is a great collection to pick up if you have Spring Fever and are itching to try something new! And remember, if you need to replenish your supplies, have questions with a product, technique or are interested in one of the products I've used here please contact your ANGEL and she'll be happy to assist you! 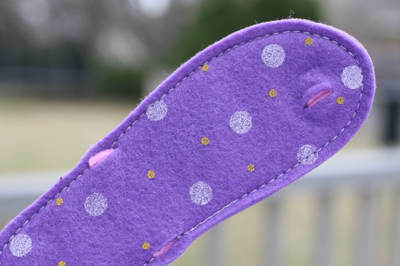 If you don't have an Angel yet ... click on SHOP NOW on our homepage and find one in your area today!